This germy hands experiment is a fun way to teach kids good habits to help keep them healthier during cold and flu season. Sponsored by MedExpress Urgent Care. Temperatures may be falling, but cases of cold and flu are on the rise! Last year’s flu season was especially active — in fact, it was the first to be classified as high severity across all age groups, according to the CDC. Even though the 2018-2019 flu season hasn’t officially kicked off yet, it’s important to start good habits now to keep your family healthy. With younger kids, the idea of “germs” may seem a bit abstract. I tell my 4-year-old all the time that we need to wash hands throughout the day to kill germs, but I’m not sure if she actually knows what that means. 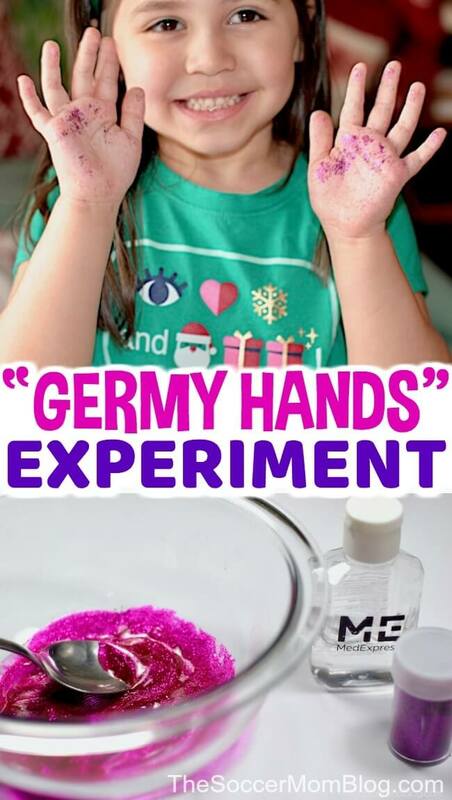 That’s why I created this glittery germy hands experiment, with the help of MedExpress, to show her how germs spread. MedExpress is a neighborhood medical center dedicated to providing high-quality and affordable care to families. They’ve recently opened several Houston-area locations. To find your local center, visit MedExpress.com. Together, we put together this fun activity to teach kids about germs and healthy habits. 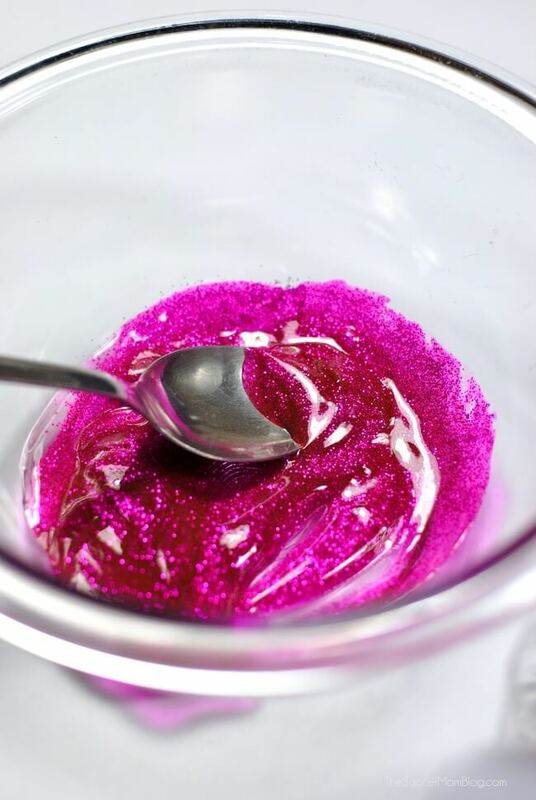 STEP 1 – In a small bowl, combine hand sanitizer and glitter. You won’t need the entire bottle of sanitizer – only enough to cover two sets of hands (or however many kids are participating). Stir together the sanitizer and glitter and set aside. STEP 2 – Print a copy of the Germy Hands Activity Sheet for each child. Ask them to trace their hands on the sheet, then draw what they think germs look like inside the outline of their hand. 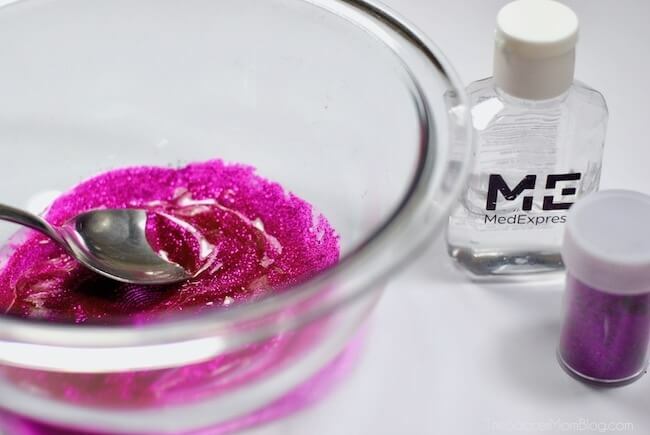 STEP 3 – Ask kid(s) to dip their hands into the sanitizer/glitter mixture so that their hands are coated, then have them rub their hands together until dry. 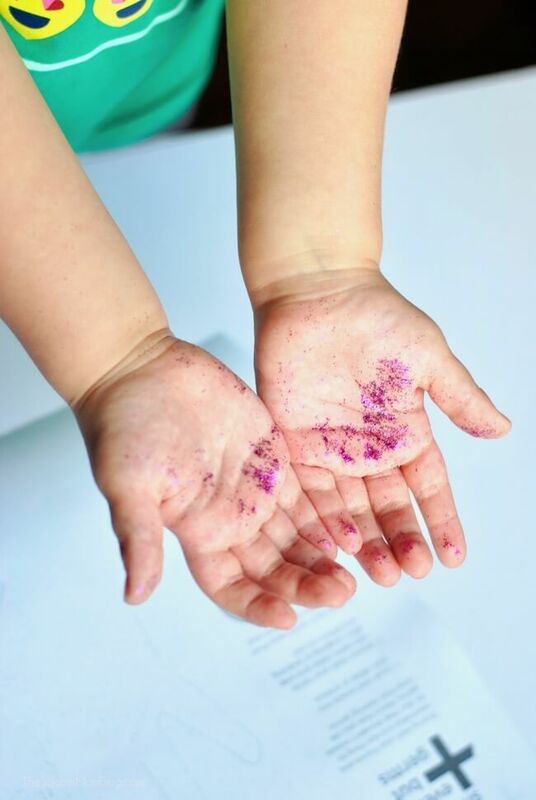 I know, I know – glitter has a reputation for being messy, but the cool thing about mixing it with hand sanitizer is that it keeps the glitter from flying all over the place! 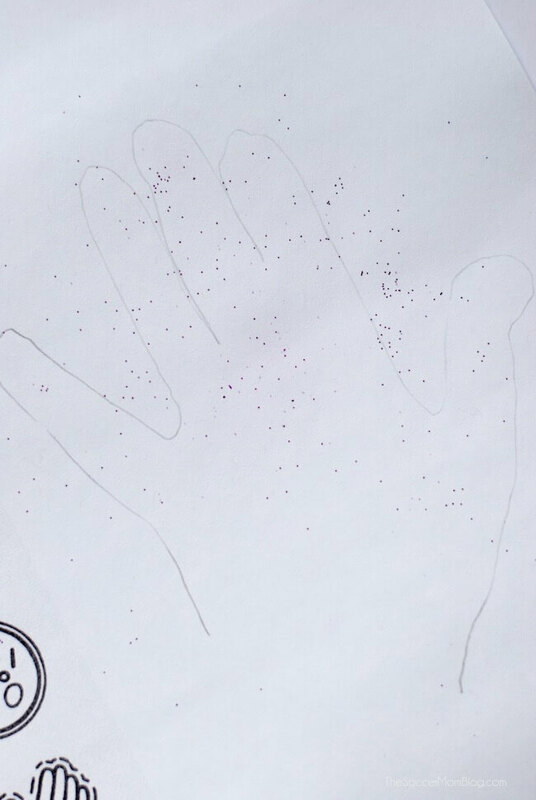 STEP 4 – Once your child’s hands are dry, ask them to place their palm into the handprint they traced on the activity sheet. What happened to the “germs” on their hands? STEP 5 – Next, have kids shake hands with each other (or you) and observe what happens to the glitter “germs.” Did the germs spread to the other person? If you’re feeling brave, ask kids to touch their favorite toys, door knobs, etc. and see if the germs continue to spread. STEP 6 – Practice washing hands and see how long it takes to wash away germs – it often takes longer than we think! Even though we can’t see them, germs spread quickly from person to person. Germs can even spread to objects that we touch! Washing hands is crucial to preventing the spread of germs and keeping us healthy. Recite your ABCs while washing hands to ensure that they get a thorough clean. When washing hands, pay special attention to fingernails and between fingers. Keep hand sanitizer ready for occasions where soap and water and not accessible. Bring your own water bottle when you’re on the go and avoid public water fountains. Frequently wipe down surfaces like countertops and light switches – and especially cell phones. Thank you to Dr. Christopher Dietz and Dr. Ranjit Singh of MedExpress for these healthy tips! Even with the best hand-washing habits, cold and flu viruses can be stubborn. 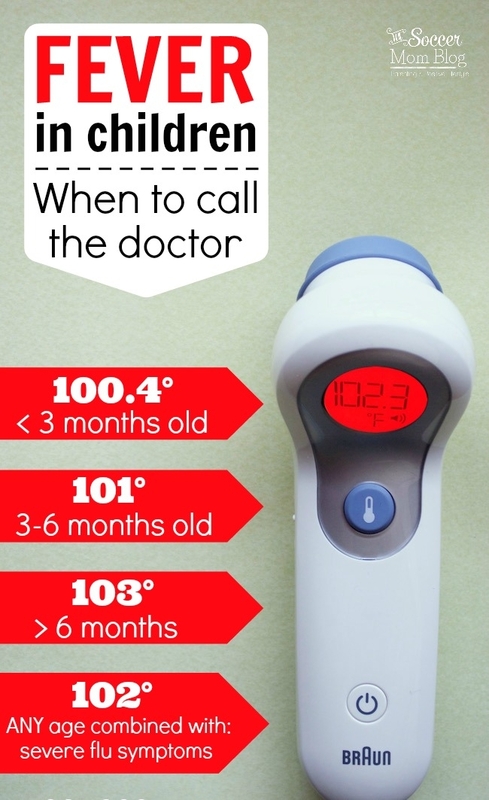 That’s why I have the number to our closest MedExpress location on hand just in case. When dealing with non-emergency situations, I avoid the ER at all costs (pun intended!) A traditional emergency room is usually significantly more expensive than an urgent care facility like MedExpress. Plus, MedExpress provides amazing service and shorter wait times. Injuries and illnesses don’t always occur during normal business hours — that’s why MedExpress strives to make it easier for families to get the care they need. Plus, unlike a traditional emergency room, at MedExpress, most patients are in and out in an hour or less! As a mom of three, the convenience factor is crucial! Click here to find a MedExpress location near you!